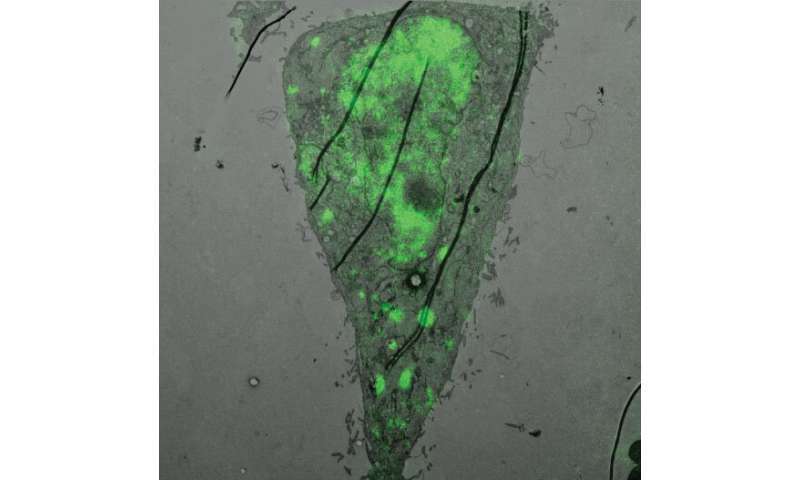 Electron microscopy image overlaped with fluorescente microscopy image of an epithelial cell infected with influenza viurs. Viral inclusions where the influenza genome assembles are located in green. Credit: Sílvia Vale-Costa and Ana Laura Sousa. The influenza A virus is known to form new strains every year. These strains are the result of small variations occurring at the level of the genome, which cause the virus to change and become unfamiliar to the immune system. A new study by Maria João Amorim's team, from the Gulbenkian Institute of Science, now reveals where the genomes of the influenza A virus are assembled inside infected cells. The results will be published this week in the journal Nature Communications and may contribute to therapies that prevent or combat new strains of influenza viruses. Influenza A virus can only multiply within the cells of the body it infects, because it needs to use the cellular machinery of the host. When infection occurs, the virus enters into the cell and releases its genetic material and some proteins. But these viruses have an unusual peculiarity: Their genome is segmented into eight distinct parts. Thus, during virus multiplication, the eight parts of the genetic material are replicated many times. The formation of new viruses requires that these eight segments are assembled into the same viral particle, which implies a very precise selection out of thousands of molecules that are mixed. Where this selection is made has been unknown until now. The study reveals that the selection of the genetic material is made in viral-induced compartments called viral inclusions. The researchers found that these compartments are not delimited by a membrane, as are the traditional organelles in the cell. Instead, viral inclusions are separated from the surroundings by a process called liquid-liquid phase separation. This process is similar to what happens with vinegar and olive oil when mixed together. In this way, the genetic material of the virus is segregated and confined to a small space where it is easier to assemble the sets of eight pieces that form the genome. "Our results pave the way for alternative therapies that could target genome formation, or the place where the genome is formed," says Maria João Amorim. "This work is innovative because it is one of the initial observations that demonstrates that viral infections use phase separation processes." Phase separation in biology is a research area of increasing interest. Changes to this process are both the cause and consequence of many diseases, mainly neurological diseases. The work published by the IGC team opens the door to investigate the role that phase separation plays in infections caused by influenza and other microorganisms.